What do you say to filling three weeks with me May 29th? I have not yet filled your time in January and see no chance of doing so with an attraction equal to yourself. There are plenty of little fish but I don’t want them if I can help it. So as you can’t come then come at the above date. With a Merry Christmas and Happy New Year. While Booth’s ability as an actor has been questioned by many authors, he nevertheless had the ability to draw a crowd. This letter appears to state that Booth was, at one time, asked to play in Chicago in January of 1865 and declined the invitation. Historically, McVicker’s had been very kind the John Wilkes Booth. In January of 1862, he made his premiere there selling out the 2,500 seat theatre. He would return there several times over the next two years. But, as the years turned from 1864 to 1865, Booth’s mind was on other aspects. He had suffered large losses in his oil ventures but told family and friends of his success. He spoke of big plans that would allow him to retire from acting for good. While wanting of money, an engagement in Chicago would separate him for too long from his new plan and target: Abraham Lincoln. 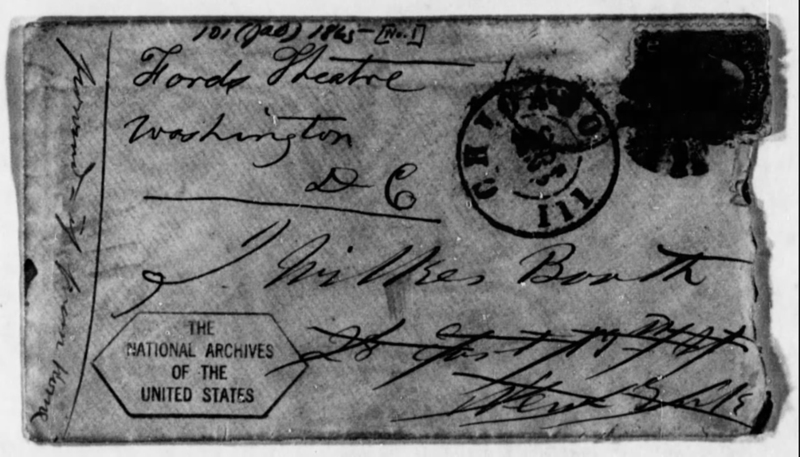 We can see that the letter was originally addressed to “J.Wilkes Booth, 28 East 19th St., New York”. Written along the left hand side, in McVicker’s handwriting is the note, “forward if from home”. 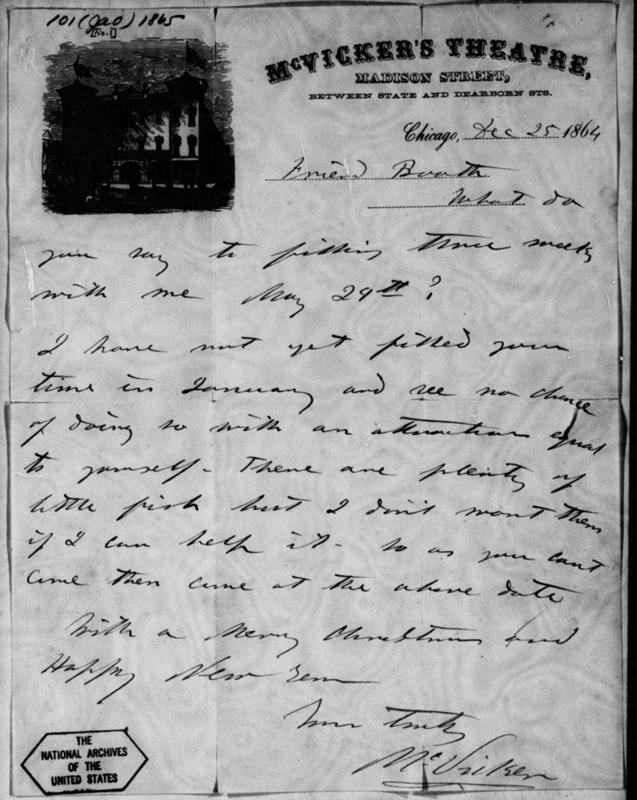 McVicker had initially sent the letter to the Booth home in New York. In September of 1863, Edwin Booth purchased the house on 19th St. near Gramercy Park in New York City as a permanent residence for his family. Mary Ann, Rosalie, and Edwin’s daughter Edwina, lived there year round. During breaks in touring and when the theatrical season ended, Edwin and John would both reside in the house. Despite the brothers’ desire to keep the peace in the presence of their mother, the close quarters caused Edwin and John to engage in many arguments, usually stemming from their opposite political beliefs. In late November of 1864, Edwin finally had enough of his brother’s secessionist talk, and kicked him out of the house. Booth would briefly stay with his sister Asia in Philadelphia, before moving to Washington. Harry Ford provides a tremendous amount of detail regarding Booth’s letter. It seems that this was done to direct attention away from the fact that it was probably him (or someone in his office) that divulged to Booth that Lincolnwas coming. How our history could be different if, on April 14th, 1865, Booth had not received a similarly addressed letter like the one above. He may have continued on past Ford’s never knowing Lincoln was going to be there that night.